Defying the passage of time, Mont-Saint-Michel’s towering silhouette stands magestically in the heart of the bay, where thousands of pilgrims and visitors converge, Founded in the 8th century by Bishop Aubert of Avranches, it became one of the four great mediaeval sanctuaries for Christian pilgrims, alongside Rome, Saint Iago de Compostella and Jerusalem. Down the centuries pilgrims from everywhere have flowed in their thousands to Mont-Saint-Michel, weaving the network of trails we call the chemins montais – the Mount Ways. It is these ancient ways, so rich in history and associations, that Chemins du Mont-Saint-Michel seeks to rediscover, restore and return to public use. 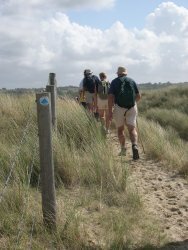 By making these ways accessible to various forms of travel (by foot, cycle or horse) the association offers anyone following the footsteps of pilgrims a new approach to this marvellous monument. Green tourism has taken off in recent years and continues to attract ever-greater numbers of people drawn by a desire to immerse themselves in nature and the natural environment. Furthermore, the success of the pilgrim routes demonstrates a growing demand for a cultural and spiritual dimension to this sort of hiking. We now know that pilgrimage played a rôle in the developing greater knowledge and understanding between peoples of widely different origins and backgrounds. Like pilgrims of the past, today’s walkers know very well that meetings on the road, even if brief, are often among the most rich and real. Language barriers and prejudice vanish, preconceptions and fixed ideas obout oneself and others fade away… Mutual support and tolerance take over, all by themselves. Boundaries cease to exist and all men are equal on the road. 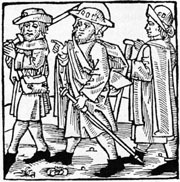 By rediscovering the routes taken by pilgrims from all over Europe during the Middle Ages (Great Britain, Ireland, the Germanic countries, Italy…) the association aims to extend the network of St Michael’s Ways into other European countries and to develop new partnerships for purposes such as research, tourism or culture. Through its work the association also hopes to renew the links that unite Mont-Saint-Michel with other great sites dedicated to the Archangel in Europe. It was for this reason that, in January 2000, The St Michael’s way earned the right to label itself a partner in the Council of Europe’s "Europe, A Shared Heritage". 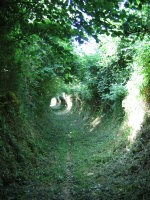 Later, in January 2007, the St Michael’s Ways were officially recognised as Cutural Route of the Council of Europe. This status marked a significant stage in the association’s development.